The moon will look plenty full tonight, though it will really be a waning gibbous moon that lights the sky. Watch it rise in the southeast some time after sunset. The moon rides low above the horizon in mid-northern latitudes. If your southeastern horizon is rather cluttered, you might have to wait a few to several hours after sunset for the brilliant orb to clear any obstacles. Once you have the moon well in sight, look for the nearby bright star. Tonight the moon pays a visit to Antares, the ruddy heart of the constellation Scorpius, the Scorpion. The star’s reddish character may be hard to discern next to the spotlight of the big and brilliant moon. Antares may also be twinkling madly and shifting colors. When a star lies low in the sky, we see it through much more air than if it is straight overhead. This increases the chances that atmospheric turbulence will distort incoming starlight. Antares is a supergiant star and appears red because its outer layers are cool – at least cooler compared to other stars. Although it appears as a mere pinpoint of light in our night sky, Antares is so large that if it were to take the place of our sun, it would extend beyond the orbit of Mars. Yes, even the great Celestial Scorpion has a heart. 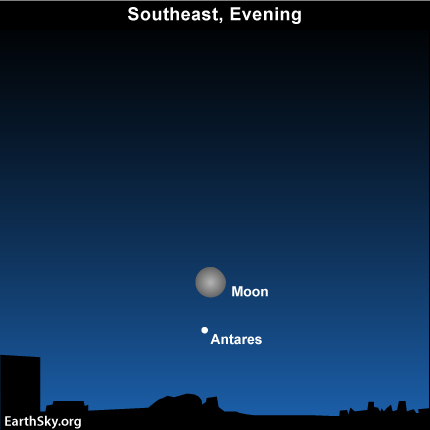 Use the moon to find Antares, the Scorpion’s beating heart, tonight! Site contents copyright © 2019 Recorder Online	except as noted. All rights reserved. | 86 queries in 2.354 seconds.